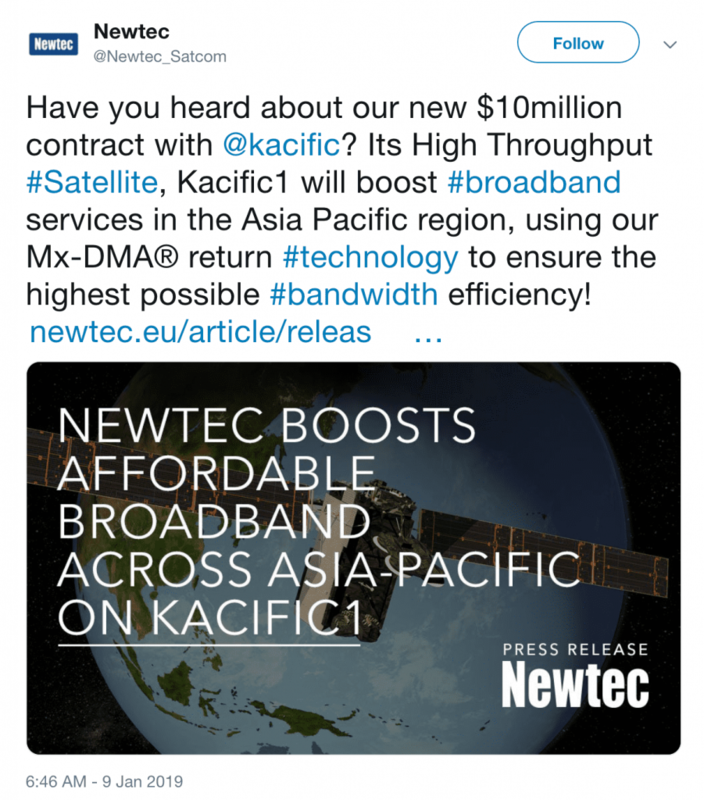 10 January 2018 – Newtec,a leader in the design, development and manufacture of equipment for satellite communications, today announced that its Newtec Dialog®VSAT multiservice platform has been selected by broadband satellite operator, Kacific, for its new High Throughput Satellite, Kacific1, to significantly expand its broadband service deliveryin underserved areas of South East Asia, New Zealand and the Pacific Islands. The initial contract is for $10million of Newtec Dialog hubs and this is expected to result in further terminal procurements totaling several million in the first years of service. Kacific1 will deliver affordable, high-speed internet broadband to telecommunications companies, internet service providers and governments throughout the region, with Newtec’s Mx-DMA®return technology providing the highest possible bandwidth efficiency. The Kacific1 satellite features 56 high power subscriber spot beams, each with the capability to provide targeted capacity at high speeds. Kacific services enable access to high demand applications, such as community internet access and mobile backhaul, that will help stimulate socio-economic activity throughout the region. Public institutions will benefit from dedicated services including healthcare, education and civil defense, in areas that are beyond the economical reach of terrestrial infrastructures in most of Kacific’s coverage areas. Kacific was recently presented with the Better Satellite World award for its focus on connecting underserved populations.